This is an entirely new setting of the Bible, published to coincide with the 400th anniversary of the King James Version but intended to become a staple of the Cambridge list for many years to come as a new and distinctive format. 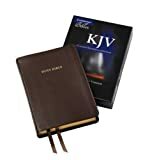 This particular edition is the first new Cambridge KJV reference Bible for over half a century and has been carefully designed for the modern era to meet an increasing demand for a more accessible format and comfortable reading size. It is typeset in Lexicon No.1, a digital font designed for easy reading and with many similar characteristics to traditional hot-metal Bible typefaces, thus marrying the best of the old and the new. The print is black-letter throughout and the text is presented in paragraph (rather than traditional chapter and verse) style and in a single-column format. The notes and cross-references have been relocated to the outer margin, leaving the text relatively free and unencumbered. The Bible includes 15 colour maps and - instead of a conventional concordance and dictionary - a Reader's Companion which offers the key elements of those features in one place. It is printed on India paper with art-gilt edges and is bound with two ribbons in brown top grain calfskin leather.